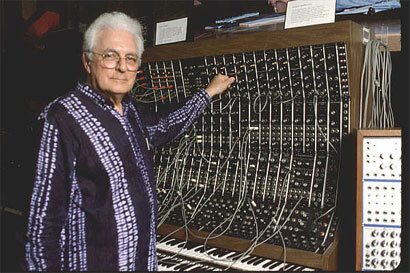 Today Google are celebrating Robert Moog’s birthday, the legendary pioneer of electronic music who passed away on August 21st 2005 would have been 78. Moog transformed musical synthesisers in the 1960s by making an affordable synth that was easy to use and incorporated a small keyboard. To mark his 78th birthday, Google have dedicated a 'doodle' on their home page to his memory. The Google logo has been converted into a fully interactive digital version of the iconic 'Minimoog' synth. It can be ‘played’ by clicking on its keys using a mouse cursor. The sound can also be adjusted using the collection of control knobs that have been recreated on-screen and if you really like your composition, you can even record it and play it back - using the animated tape recorder that has been incorporated within the doodle. Moog was encouraged by his father to build electronics from a young age and by 14 he had built his first electronic instrument, a theremin. He then founded a company at the age of 19 to manufacture theremin kits before he developed his iconic synthesiser and also his company which is still running today, Moog Music. It was through this company that he developed equipment that has been used by musicians and producers the world over. Moog's digital instruments include the Minimoog, the Model D, Minimoog Voyager, Little Phatty, Moog Taurus Bass Pedals, Moog Minitaur, and the Moogerfooger line of effects pedals. One of Moog's first customers was Wendy Carlos who worked on the soundtrack to Stanley Kubrick’s ‘A Clockwork Orange’. Moog’s synthesisers turned electric currents into sound, influencing bands like the Beach Boys and the Beatles before shaping what would become electronica and dance music as we know it today. His work also attracted high profile fans, including The Beatles, The Doors, and even Pro Mobile's Editor Eddie Short who shares Robert Moog's birthday!